The U.S. solar industry faces a very different landscape than it did a year ago. Prices are up, uncertainty is rife and some big-ticket projects have been paralyzed because of the prospect of tariffs, which could reshape power markets and affect thousands of jobs. Meanwhile, the man most responsible for these changes, President Trump, has hardly said a word. Nearly a year into his presidency, the famously opinionated president has scarcely let the word "solar" escape his lips, while endorsing policies that are pro-fossil fuel but not necessarily anti-solar. He mentioned this summer that he'd like to see a U.S.-Mexico border wall topped with solar panels. He squinted at the solar eclipse and seems to have a perpetual tan. But that's not much for the industry to go on. 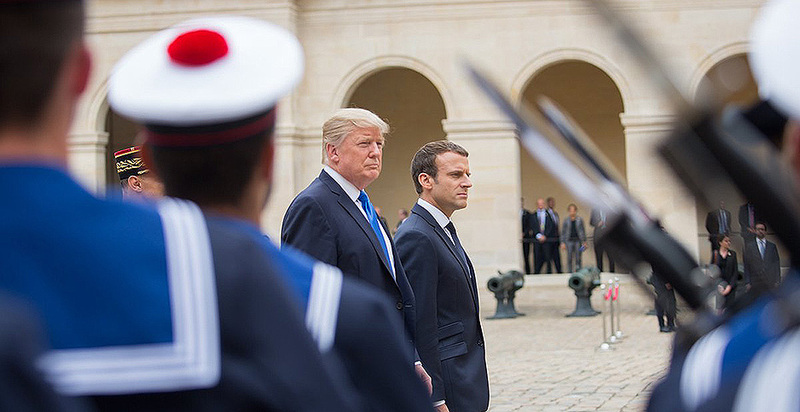 "The biggest challenge with this president is just that, uncertainty," said Morten Lund, a lawyer at firm Stoel Rives who represents large wind and solar developers. "We just don't know what he's going to do." But the wait is almost over. On Monday, the U.S. International Trade Commission (ITC) forwarded its recommendations to the president on whether to create worldwide trade barriers to foreign-made solar products. His decision is due by Jan. 12. 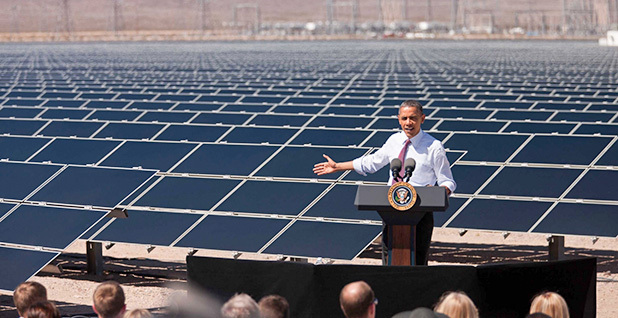 It is shaping up to be the most momentous solar policy decision by a president in years. Most of the industry — the bulk of manufacturers, developers and installers — dread high tariffs that could slow business and cause heavy job losses. Meanwhile, the handful of bankrupt manufacturers that brought the trade petition believe that punishment is the only way to beat back Asian competitors and rescue an American-born technology. Trump has given no indication how he will act. However, the president in early August expressed impatience with the slow pace of his trade agenda, telling his aides to "bring me some tariffs" (Greenwire, Aug. 28). Trump's neglect of solar, benign or otherwise, has had real-world consequences. Analyst firm GTM Research recently estimated that in the United States, prices for high-quality imported solar modules have risen by about 10 cents since the first quarter of this year, even as prices have declined in China, Japan and India. The reason? U.S. solar developers have snapped up products as a hedge against the uncertainty around Trump's tariff decision. "Without a doubt, the trade case is the most impactful thing that has happened to our industry in the last year," said Abigail Ross Hopper, the CEO of the Solar Energy Industries Association, which has led industry opposition to tariffs, claiming that it puts the sector's 260,000 jobs at risk. Many in the industry report that 2017 nonetheless has been a good year, since the industry entered the tariff issue in the midst of a steep climb in demand. But the haze around tariffs has caused real pain in utility-scale solar, where margins are razor-thin and developers are competing against super-cheap natural gas. For example, a 100-megawatt, $100 million solar project in West Texas has been delayed because of tariff doubts. The developer, McCarthy Building Cos. Inc., said an additional $400 million of projects nationwide had been canceled, according to an account in The Dallas Morning News. "Every one of our customers said things are pretty much indefinitely on hold until there's clarity," Scott Canada, the company's vice president for renewables, told the newspaper. The effects have also been felt in the rooftop-solar industry. "It has already raised my prices on solar panels by about 15 to 20 percent," said Barry Cinnamon, the founder of Cinnamon Solar, a rooftop installer based in Silicon Valley. "What it has done that is a little more ominous is that it's made it impossible to price projects for next year." Even as Trump hasn't suggested how he will act, the fact that tariffs are even up for consideration may be because of the stances he's taken. The trade case was filed under Section 201 of the Trade Act of 1974, a rarely used proviso that trade lawyers sometimes call a "hammer" for its indiscriminate nature. While most trade actions target individual countries, Section 201 raises trade walls against the entire world. This case was lodged with the ITC in April by Suniva Inc., a Georgia maker of solar cells and modules that made its complaint just days after filing for Chapter 11 bankruptcy. It laid out a case that its business had drowned in a flood of inexpensive solar panels from Asia. The technology Suniva uses, crystalline silicon photovoltaic modules, was invented in the United States, but almost all U.S. manufacturers have perished in recent years in the face of low-price product from China. Suniva's public statements seem to echo the combative tone, and sometimes the exact phrases, of Trump. "The reality is that President Trump's first big opportunity to change the industry is right now because he has a legitimate opportunity to revitalize American high-tech manufacturing, stop China's cheating and put an end to China laughing at our country and our leadership while it hacks our companies, steals our technology, and kills off our manufacturing industry by selling imitation goods for less than what they cost," Suniva said in a statement to E&E News for this story. Before Suniva's complaint, a blanket-tariff case had not been filed for 16 years. "I'm not certain if a Section 201 case would have been filed if this administration were not in power," said Hopper, the president of SEIA. Suniva's case seemed like a long shot until SolarWorld Americas Inc., one of the only other surviving domestic module manufacturers and a winning veteran of other trade battles, joined the Section 201 complaint. The four-member ITC voted in October in favor of tariffs, and two weeks ago detailed its recommendations to the president. The proposals varied in their severity. The highest called for a 35 percent tariff on modules and a 30 percent tariff on cells. The most moderate called for a limit of 8.9 gigawatts in the first year — about the level in 2016 — and an increase afterward. All recommendations would see the tariffs ease with each passing years. The ITC's guidelines were labeled half-measures by both opponents and supporters (E&E News PM, Oct. 31). Trump is not bound by the ITC's recommendations and could follow them, impose stronger measures or choose to impose no tariffs at all. Trump's rare statements on solar suggest his thinking is evolving. In a 2011 interview with Piers Morgan on CNN, Trump said: "The solar thing is not working out. I know all about solar. I know about wind. I know about solar. And you know what, they're all fine, but they're not — I did a solar project. You know what the payback was? Thirty years. I get my money back in 30 years. Well, in 30 years, I mean, the panels are going to be disintegrated in 15 years." On Twitter, Trump's favorite media platform, he mentioned solar only a few times, five years ago. They were attack lines against President Obama, criticizing loan guarantees and other government funding. "It is a shame Keystone wasn't powered by solar panels and wind because then @BarackObama would have wasted billions on it," he tweeted in 2012. Since becoming president, it appears that Trump's remarks on solar power were mostly delivered at one June campaign-style rally he held in Cedar Rapids, Iowa. First, he cited solar on an equal footing with all energy sources but coal. "We are going to have all forms of energy, but coal is something we have a tremendous advantage of," Trump said. "We are going to have all, whether it's natural gas, alternative sources, we are going to have everything. But power — it's a power for our electric different plants and furnaces. It's a power. We use electric, wind, solar, coal, natural gas, nuclear if the right opportunity presents itself." He went on to venture that solar could be installed on the wall he wants to build on the border with Mexico. "We're talking about the southern border, lots of sun, lots of heat. We're thinking about building the wall as a solar wall so it creates energy and pays for itself. And this way, Mexico will have to pay much less money. And that's good, right? Is that good?" Trump told the Cedar Rapids crowd. Trump would go on to repeat the idea to a group of journalists in July. However, the design concepts for the wall, unveiled in San Diego in October, included no solar options. Many advocates believe that, whatever Trump thinks about solar, his attempts to ease regulations and rules on fossil fuels and nuclear power is tilting the energy industry in ways that disadvantage solar. Cinnamon, the California rooftop installer, ticks off a list of things Trump has done that fall roughly in that category: halting Obama's Clean Power Plan, pulling out of the Paris climate change agreement, approving the Dakota Access and Keystone XL pipelines, opening up more federal lands to fossil fuel extraction, giving loan guarantees to nuclear power plants, and the proceeding before the Federal Energy Regulatory Commission to favor fuel-steady sources of energy like coal and nuclear power plants. But maybe solar, which last year passed the milestone of powering 1 percent of the U.S. electric grid, simply isn't on Trump's radar. "I think solar is just not big enough for him to care about," Cinnamon said.